Taking place over two nights and two venues in Tampa, FL, the Inaugural Absolution Festival for post-punk and darkwave music has been announced in association with the Communion After Dark podcast and Endoxa Booking. Headlining this year’s festival will be prominent electro/synthpop act Assemblage 23 and post-punk sensation ACTORS, with other bands on the bill including Sleeping Pills, Panic Priest, Astari Nite, Twin Tribes, Push Button Press, Bootblacks, and more. A full listing of performing bands can be found on the Absolution website, with tickets going on sale on February 8 via TicketFly. 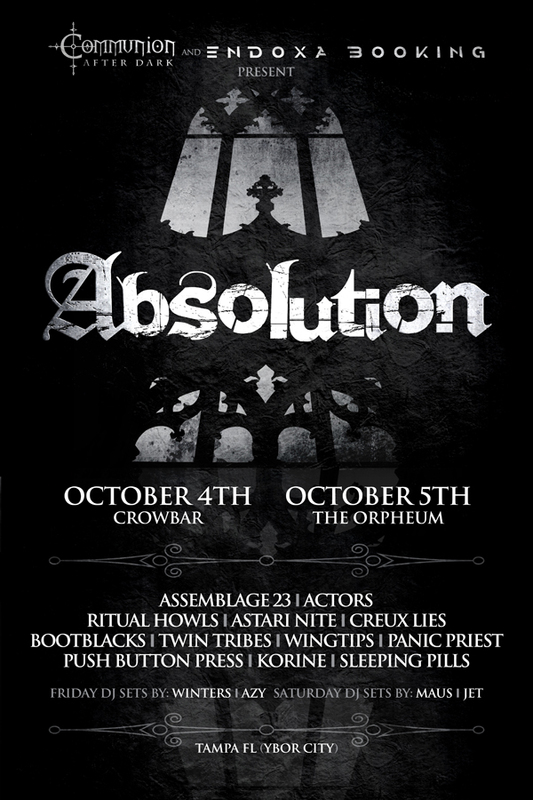 The Absolution Festival will take place on October 4 at Crowbar and October 5 at The Orpheum, with DJ sets provided by Maus, Winters, Jet, and Azy.